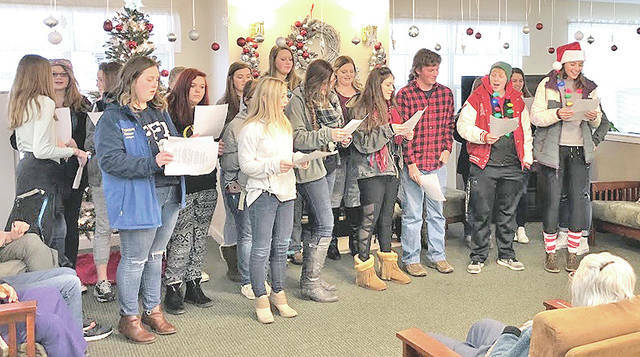 The Hillsboro FFA chapter visited the Heartland of Hillsboro and Bell Gardens facilities this month to sing Christmas carols including “Jingle Bells,” “Santa Claus is Coming to Town,” and “Rudolph the Red ‘Nosed Reindeer” to bring Christmas cheer to the residents. Katie Craig said, “This was a great way to spread happiness throughout the community.” At the conclusion of caroling the FFA members went to Walmart to purchase gifts for Highland County families in need for the Christmas season. The chapter bought winter clothing and toys for them. The next day the FFA classes wrapped the gifts that were purchased to take to the families. The chapter also donated boxes of apples from the fruit sale. Pictured are FFA members singing Christmas carols at Bell Gardens. https://www.timesgazette.com/wp-content/uploads/sites/33/2017/12/web1_Caroling-pic.jpgThe Hillsboro FFA chapter visited the Heartland of Hillsboro and Bell Gardens facilities this month to sing Christmas carols including “Jingle Bells,” “Santa Claus is Coming to Town,” and “Rudolph the Red ‘Nosed Reindeer” to bring Christmas cheer to the residents. Katie Craig said, “This was a great way to spread happiness throughout the community.” At the conclusion of caroling the FFA members went to Walmart to purchase gifts for Highland County families in need for the Christmas season. The chapter bought winter clothing and toys for them. The next day the FFA classes wrapped the gifts that were purchased to take to the families. The chapter also donated boxes of apples from the fruit sale. Pictured are FFA members singing Christmas carols at Bell Gardens.